When you suffer any kind of pain, in the back, neck, shoulders or any other part of the body, inflammation seems to be part of the deal. Whether your pain is due to post-surgical scar tissue, injury, trauma or muscle deterioration, inflammation generally follows. The main question people have is why. Why can’t there be pain without inflammation and why is inflammation sometimes even more painful than the injury itself? Put simply, inflammation is how the body naturally responds to injuries and pain. In fact, swelling is a defensive measure the body has developed in order to protect the injury by carrying oxygen, blood, nutrients and antibodies to the injured area for faster recovery. The more pressing issue however is chronic inflammation, which can be more painful than the initial injury. Additionally, it can cause the injury to worsen and has been linked to serious problems that include atherosclerosis. If you’re not aware, atherosclerosis has been linked to more than half of all incidences of heart attack. Chemical treatments for inflammation are quite well-known, but there are alternative dietary treatments for inflammation that can reduce swelling effectively without nasty side effects. Whether you are a vegetarian or carnivore, there are dietary options to help you reduce inflammation. Salmon, mackerel and sardines provide some of the most significant sources of omega-3 fatty acids. But for snacks and non-meat eaters there is also tofu, spinach, nuts and grape leaves. If you still aren’t getting enough, there are supplements you can take that I talk about further into this article. For many, inflammation is also the cause of more immediate long-term problems such as painful arthritis and back pain symptoms. Non-steroidal anti-inflammatory drugs (NSAIDs) like ibuprofen and naproxen are often used to relieve pain caused by inflammation but carry serious increased risks of heart attack, stroke, and stomach bleeding. Fortunately, there’s a natural option for fighting pain from chronic inflammation without the risks of NSAIDs: increasing your intake of Omega-3 essential fatty acids. Besides reducing painful inflammation, Omega-3 also helps reduce blood pressure, lowers LDL cholesterol and triglyceride levels, and promotes more stable arterial plaque – all of which have the good “side effect” of decreasing the risk of heart attack and stroke. Omega-3 fats are abundant in fresh deepwater fish, fish oil, flaxseed, and some vegetable oils including canola, flaxseed, and walnut. 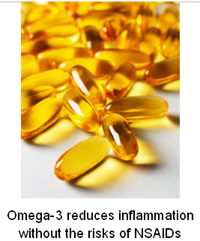 Yet most Americans eat diets woefully inadequate for maintaining healthy levels of the eicosapentaenoic acid (EPA) and docosahexaenoic acid (DHA) forms of Omega-3 essential fatty acids needed to keep inflammation low. Tested pure of toxins – many fish are contaminated with heavy metals and other toxins like mercury, so be sure your supplement is tested.